LONDON: 9 NOVEMBER 2016 - The directors of ECR Minerals plc (the “Board”) are pleased to provide the following update on the Company’s activities in Victoria, Australia. The Company has decided to prioritise drilling of selected targets at ECR’s wholly owned Avoca and Bailieston gold projects. This decision has been made by the Board following recent site inspections by Ivor Jones, a senior Australian consultant geologist who has recently joined ECR as an executive director, in company with Craig Brown, ECR’s CEO. The purpose of these visits was to re-evaluate the Company’s strategy for the Victoria projects and confirm the best route forward, with the objective of generating value for ECR shareholders. “Having recently visited the Avoca and Bailieston projects, I was impressed by the ease of access to the prospects, the obvious indications of significant historical mining activity, and the continued high level of interest and activity in the Victorian gold mining sector. This impression has been further reinforced by the recently announced merger between Newmarket Gold and Kirkland Lake Gold; the former has two operating gold mines in Victoria, including the Fosterville mine, which is located approximately 30 kilometres away from ECR’s Bailieston project. “Given these positive indications and the historical dataset in our possession, we have decided to carry out a drilling programme at selected targets at both Avoca and Bailieston to advance these projects. After a re-evaluation of all prospects within EL5433, the main Byron mine environs remain a high priority target. ECR intends to complete a reverse circulation (RC) drilling programme of approximately 550 metres to test the most significant prospects within the Byron area. An approved Work Plan is in place for drilling of these prospects, and one further necessary permit has been applied for. ECR anticipates that drilling at Bailieston will begin by early 2017,subject to receipt of the permit. Below the old Byron shaft workings into a zone interpreted to be the extension of the previously mined high-grade reef. West of the Byron shaft with a view to intersecting high-grade mineralisation that was identified during historical underground mining, but never exploited. The high-grade Maori mineralisation encountered by historical drilling. Significant historical (1980s) drill and trench intercepts from the Byron area are tabulated below. The information in the table above is historical and therefore indicative only. For more information, shareholders are encouraged to refer to the competent person’s report completed for ECR in relation to the Avoca and Bailieston projects which is available for download from the Company’s website (www.ecrminerals.com). Hard-rock, mesothermal quartz vein gold deposits as initially identified by the presence of 39 known historical hard-rock workings. Deep lead (buried alluvial) gold deposits which were too deep to be reached by historical surface alluvial workings and which have not been mined by the larger underground operations targeting the deep leads. EL5387 contains at least 33 known historic alluvial workings (including surface workings), and at least 14 old shafts for underground access to the deep leads. 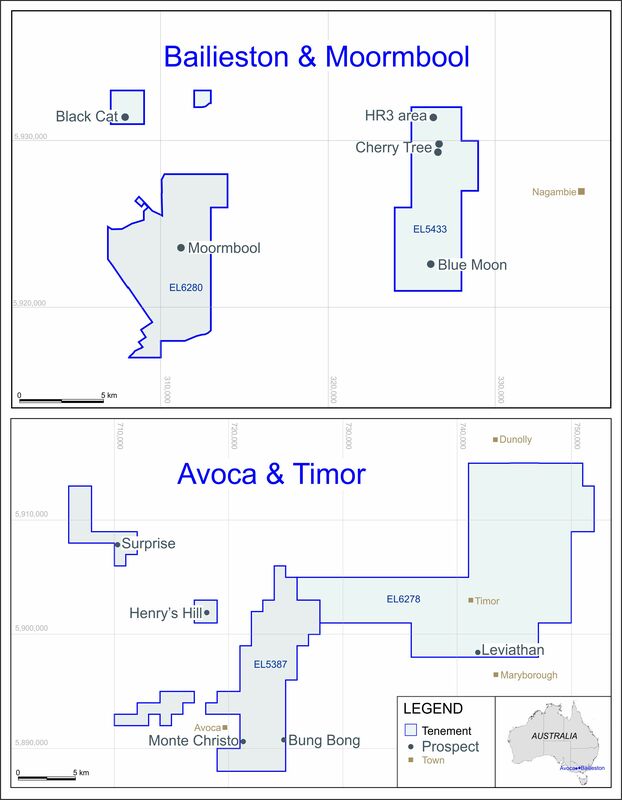 Whilst ECR is at an early stage of its re-evaluation of the exploration potential at Avoca, nine high priority hard-rock targets have been identified, along with one deep lead that the Company considers a promising target. Initially ECR will focus its exploration efforts on the hard-rock targets, with the highest ranked target being the mineralisation near the old Pyrenees mine. The Pyrenees reef has never been drilled, but its previous production is at least 16,199 tonnes yielding 16,602oz, with bonanza grades mined in the near surface workings (2,920 tonnes for 7,805oz to 48 metres depth). These production figures do not include hand crushed gold rich material. Drill holes will be placed around the old workings to test for down-plunge (along strike) mineralisation, repetitions and other un-mined mineralisation sections below the near surface bonanza grade zones. Old mine plans show certain sections were not explored or mined. The priority deep lead was identified historically by limited drilling, but will not be targeted by drilling in this phase. A Work Plan is being prepared for the proposed drilling at the Avoca project, and will need to be approved by the Victorian authorities before drilling can begin. ECR’s 100% owned Australian subsidiary Mercator Gold Australia Pty Ltd is continuing to progress applications for two new Exploration Licences in Victoria. One new licence area is in the vicinity of the Avoca project, and the other in the vicinity of the Bailieston project.